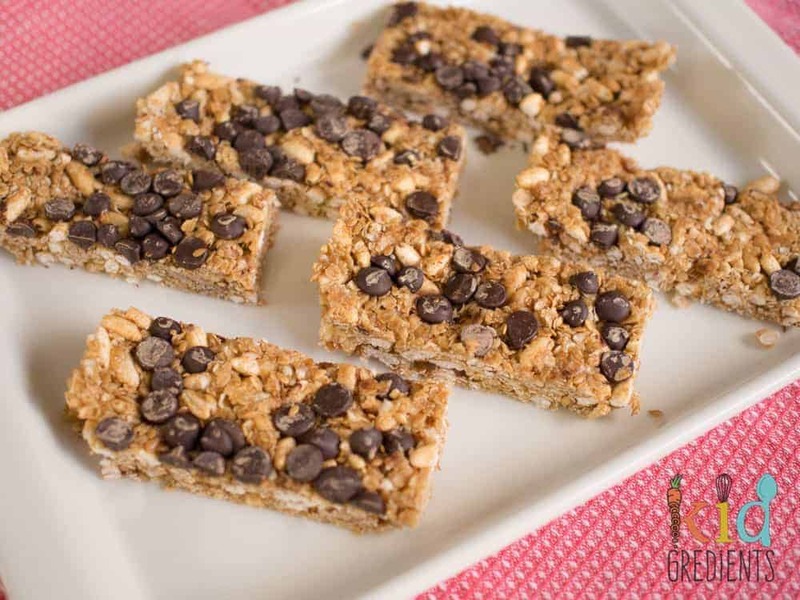 Muesli bars. They really aren’t the amazingly healthy food they pretend to be. They are kind of borderline, better than some things but certainly not the healthiest of foods. They can be filled with sugar and some contain a whole heap of fillers- you know- bits and bobs that aren’t helping their status as health foods. I decided to finally perfect my no bake chewy choc chip muesli bars this week after master 3 had a muesli bar at the park and ate it all! They are so yummy and they go together so easily! 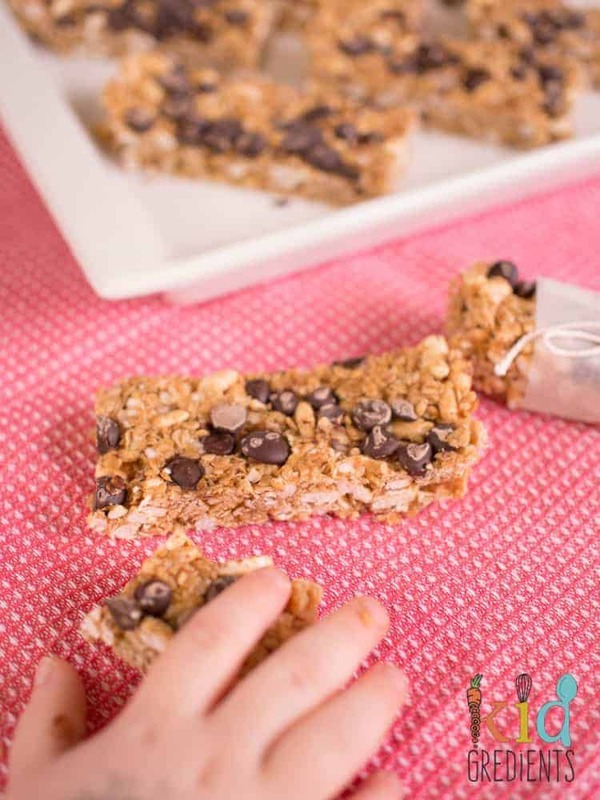 Not only are these muesli bars healthy-ish, but they contain yummy stuff that means they look and taste like the naughty bars, but are better for you. I remember as a kid being asked if I liked muesli bars and my answer was “yes”. Until my grandma bought some which were without chocolate chips! It was certainly not what I was expecting. These take me straight back to my childhood! If you want to swap the chocolate chips for something healthier, use the same amount of dried apricot chunks, sultanas, dried apple pieces, cranberries, whatever tickles your fancy! The small amount of good quality dark chocolate chips in these just gives them an extra bit of yumminess and appeal without adding massive amounts of sugar. 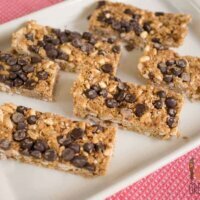 Yummy and easy to make these no bake chewy choc chip muesli bars are perfect for the lunchbox and super kid friendly! Better than bought ones. In a sauce pan, melt the butter with the honey and the coconut sugar. Add the oats, puffed rice, quinoa flakes, desiccated coconut, flax seeds to the hot mixture and mix well. Top with the chocolate chips, pressing them into the mixture. 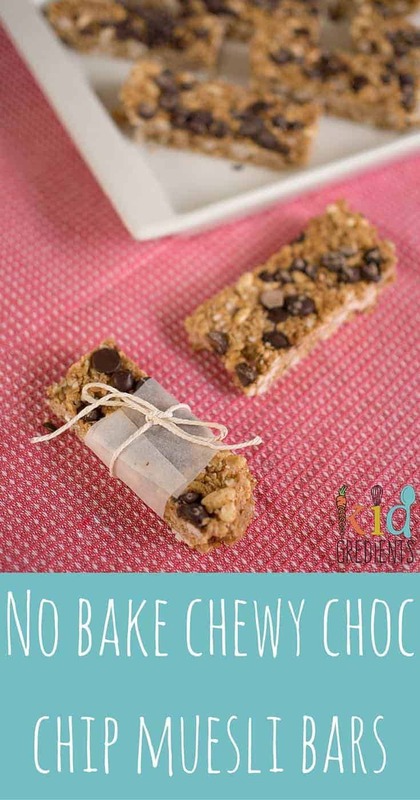 Remove from the fridge and the baking dish and slice into bars. I got 20 yumbox sized ones from this batch. And if you love these ones, why not check out these white chocolate cranberry no bake muesli bars? I’m linking up with a host of other blogger’s for School Snacks for Kids Kitchen! thanks for the recipe we have just made ours and popped in the fridge as we speak but totally forgot the vanilla will that effect it? also is it vanilla extract you use? It should be fine! Just missing a little extra bit of sweetness. they were delicious making them again today, I am wondering if to use vanilla extract or vanilla essence? Have just made these museli bars and they smell delicious!! Are you able to freeze these museli bars? Yes you can! I freeze flat on a tray and then transfer to freezer containers or bags. Hi – these are very yummy. I used coconut oil. I needed to add a lot more fat than was called for, plus i added in some additional rice malt syrup to make these stick together … and even then they were still a bit crumbly when I cut them. Thanks for the recipe. Hey! Did you bring the syrups and fat (in your case coconut oil) right up to bubbling so they were thick and glossy? It makes all the difference to the consistency. No! OK thanks for the tip – I’ll give them another go. I was trying to avoid killing all the lovely nutritional bits in the raw honey by not overheating … 🙄. Thanks for your help. Kids loved ’em. Hi Kylie, thank you for your recipe. Am i able to substitute the quinoa flakes? I need to restock my pantry. These are seriously yum and chewy! Thanks! How do they go frozen? They go really well frozen! They defrost either overnight in the fridge or in the lunchbox. Yummo!!!!!! 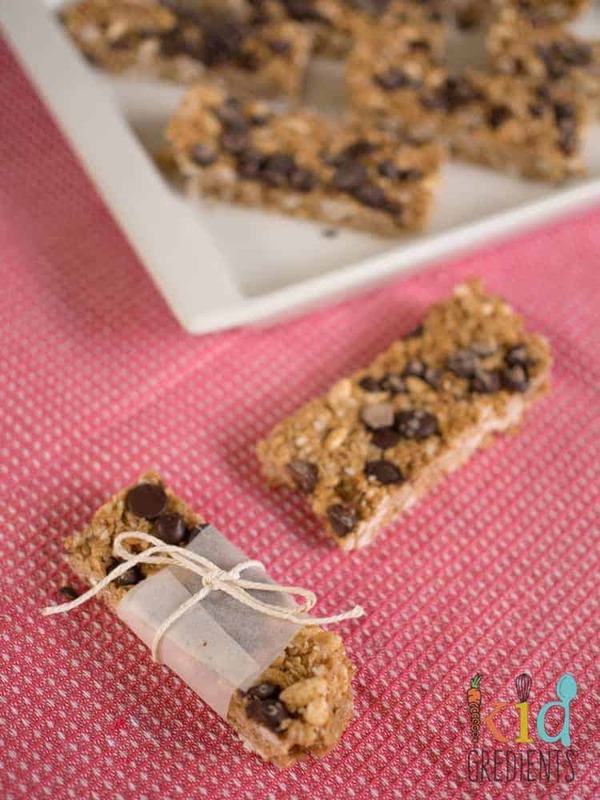 I love a good muesli bar recipe… especially when it’s no bake!!! Hehehe yep, I’d be adding the choc chips too! Hi there, just wondering what type of dark chocolate you use. The recipe looks great btw! I use callebaut dark choc chips- I buy them at Costco! Any good quality dark choc will do just fine as the bars are sweet!